Welcome back to another day on the blog! Today’s blog post will be fashion related, and I am honestly excited about it. Fall is honestly my favorite season to dress for, and lately I have had an unhealthy obsession with Blazers! 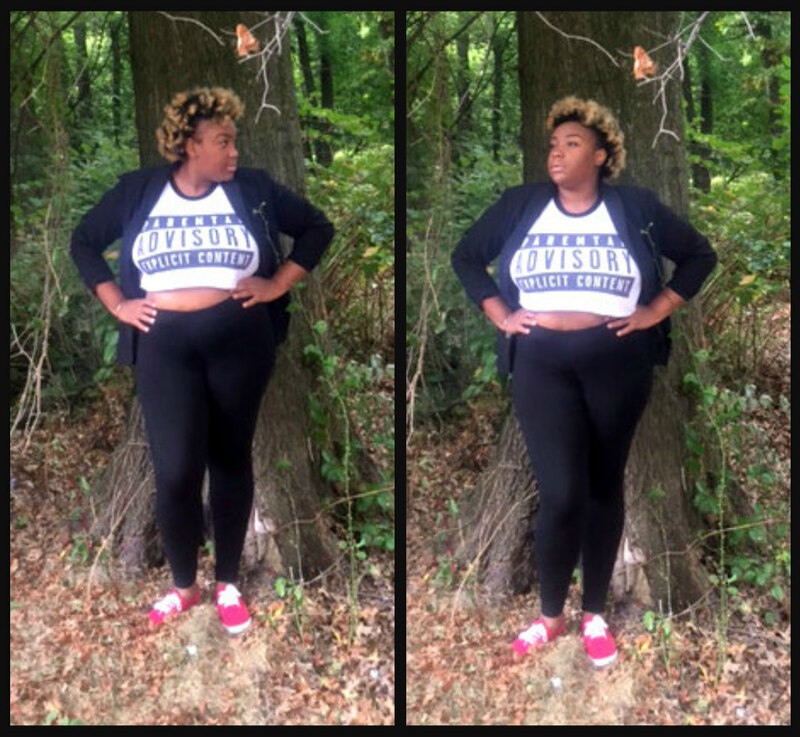 They are such a versatile piece of clothing to style, and you definitely need to run out and grab a couple if you don’t have one in your closet! This lookbook celebrates how many ways you can style a blazer. You can dress it up or dress it down, and look cute every single time! So lets get into the looks. I recently took a trip to the goodwill with my best friend Asha, and as soon I entered the blazers section I fell in love! I saw this fuchsia blazer and I instantly knew I had to have it! I decided to dress this blazer up by adding a ruffled dress from Fashion to Figure with a high heel from Nine West that also has ruffles. I decided to bring in my waist by adding this black and silver detailed belt that was gifted to me. I decided to add some texture and fun by adding a checkered print purse that I got from Burlington Coat Factory. This outfit is my favorite look in this lookbook! I saw this long African printed blazer from the goodwill and it had SHOULDER PADS! I love a good shoulder pad ladies. Sometimes I wish I was in my twenty’s in the 80’s so that I could have rocked this trend! (lol) I love anything printed, and when I saw this I definitely HAD to have it! With longer pieces like this blazer I like to pair it with something short to play with the length of my outfit. I paired this look with a black crop top from Eloquii, a black skater skirt from Deb Shops and black booties from Just Fab. I felt like this outfit needed a touch of something so I added a this gold cheetah belt from Burlington Coat Factory. Now this is one of my go to outfits. I absolutely love dressing down blazer with some simple pieces. 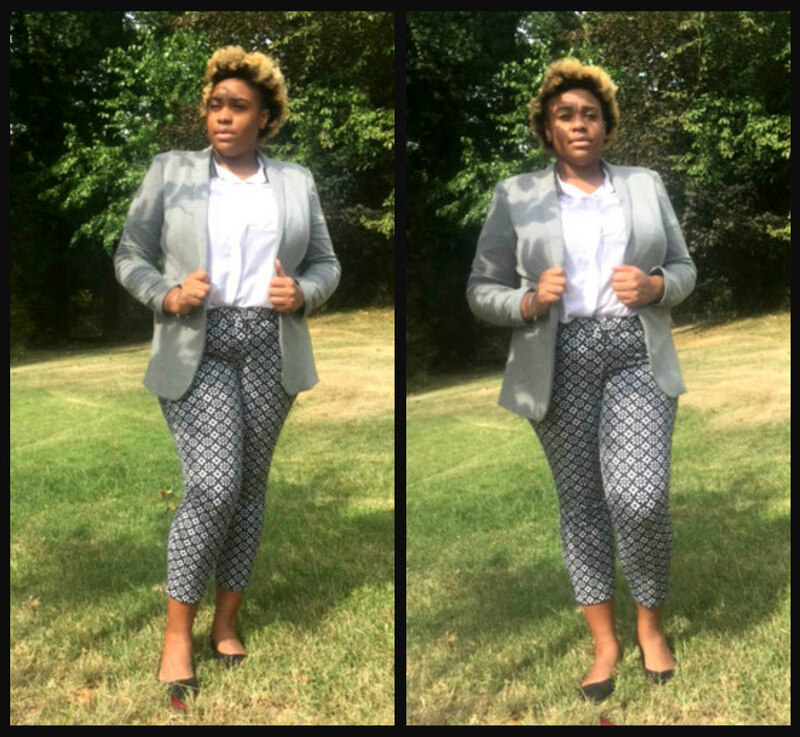 By adding these black leggings from Eloquii, a crop top from Zelie for She, and a some red sneakers from Target I have transformed a Black tuxedo type blazer into a casual outfit. I love outfits like this because simple pieces come together to make a comfortable cute outfit. This outfit its just so adorable to me! This blue blazer from Burlington Coat Factory is typically a pretty dressy blazer. 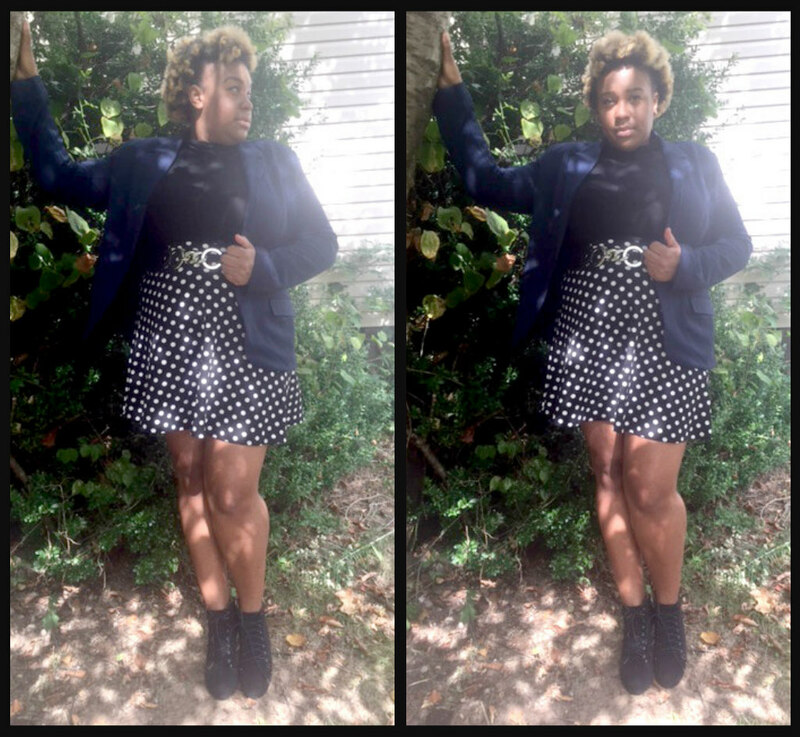 But by adding this fun polka dot printed skirt from Fashion to Figure, and this black turtleneck that was thrifted, this blazer turns from the office to a night out on the town. These booties from Ashley Stewart and this linked silver belt that was gifted pulls in this look and gives it a nice touch. Cheetah print will forever be my favorite everything! I grabbed this cheetah print blazer from the Goodwill I instantly was obsessed! 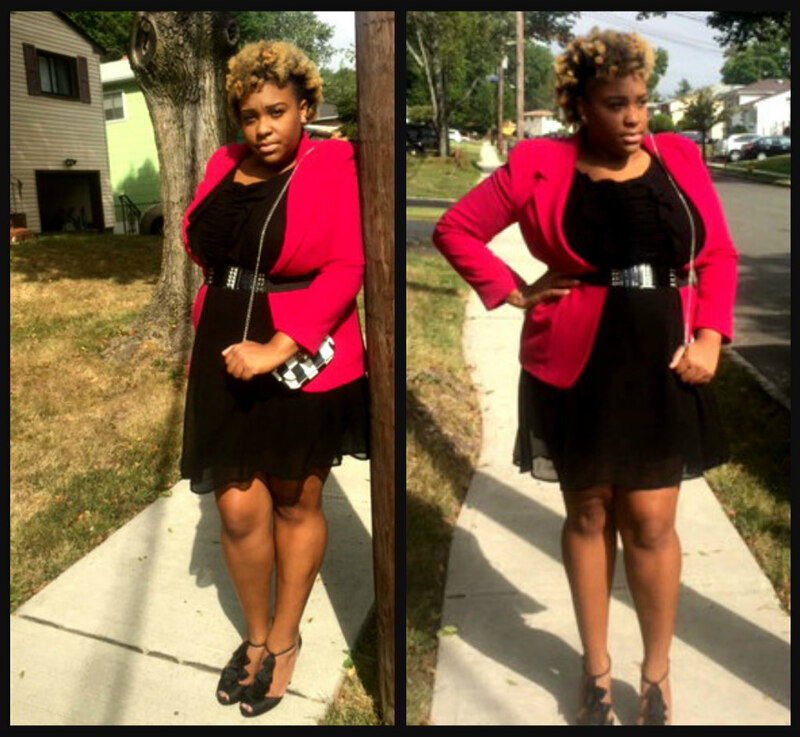 What I loved about this blazer is that it is cropped, and I love a good cropped jacket. I decided to pair this jacket with some basic essentials. 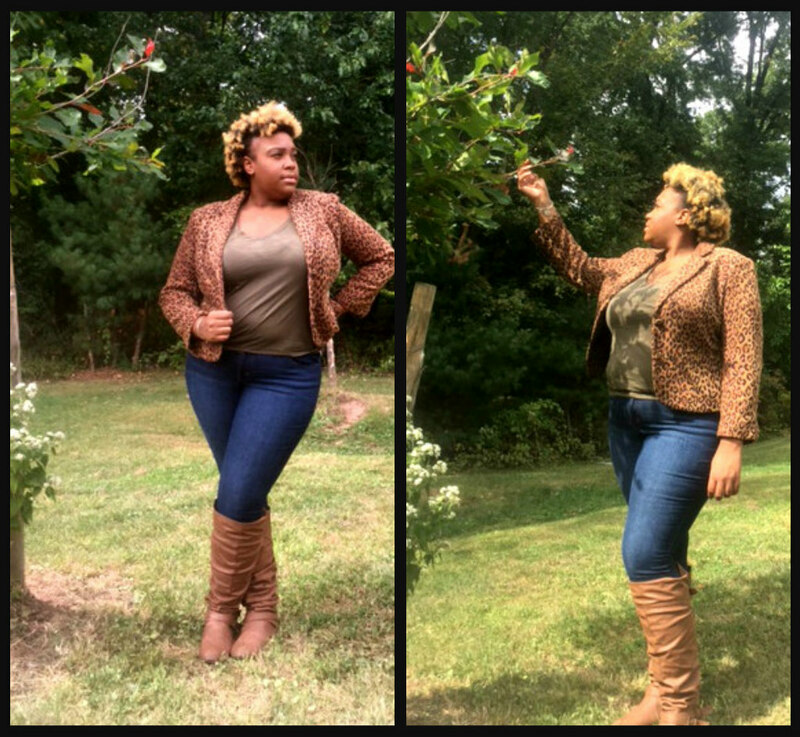 A green basic tee from Forever21, jeans from fashion to figure, and knee high boots from Deb Shops, this cropped cheetah print jacket instantly becomes a comfortable casual outfit. This outfit is perfect for a fashionista like me. It mixes comfort with fashion and I absolutely love it. I like to wear outifts like this to work since I am on my feet all day, but still need to look professional and cute. This grey blazer from Target is super comfortable! Its made out of cotton, and it is one of my favorite pieces to wear right now. This white top is from Torrid, the printed pants are from Old Navy, and the flats are from Payless. I love a good outfit that is also comfortable. So ladies that’s it for today’s blogpost! I hope you enjoyed this lookbook as much as I enjoyed creating it! 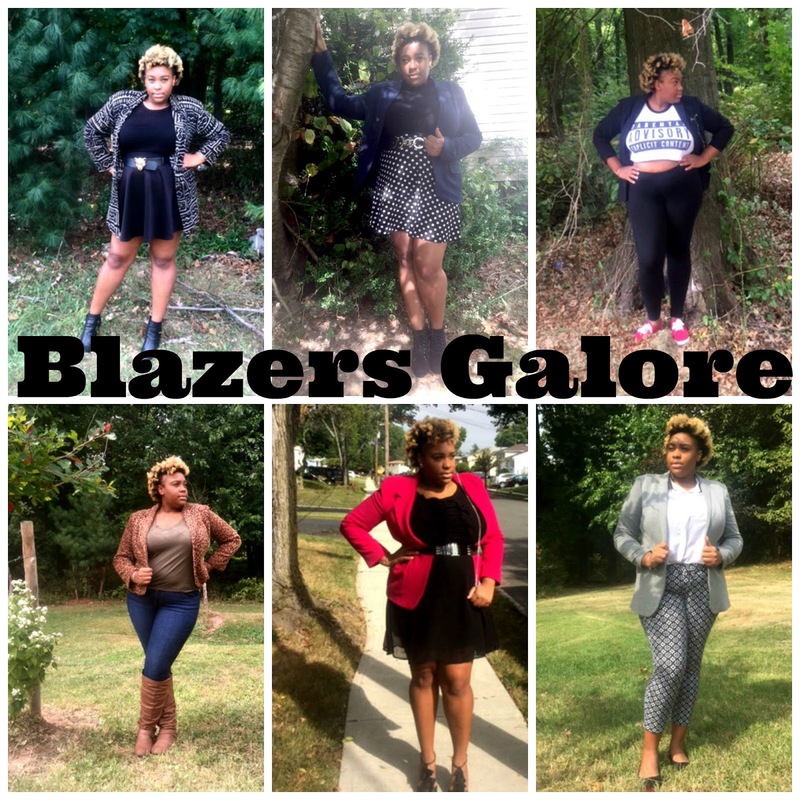 Blazers are my obsession this fall, and I hope that after you look at this lookbook you will be inspired to be obsessed with them too! Feel free to follow me on my social media. They are all linked above! Be sure to come right back here next week for another two blogpost here on the blog! I am SUPER EXCITED to share with you guys some thing special happening next month! Be sure to stay tuned. So until then I love you lots like tator tots, and see you next week!